It’s that time of week again! Cue the epic music; it’s Tutorial Tuesday! As it’s Pancake Day, I thought it would be a good idea to use this for inspiration for today’s post. 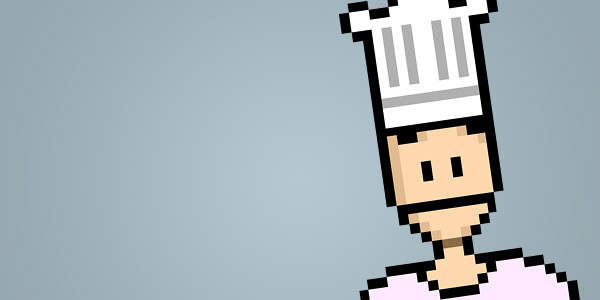 We will in fact be cooking some pancakes with our lovely pixelated friend, Bob. Doesn’t he look ecstatic? The animation above is achieved using a combination of HTML, CSS3 and images. In addition, please note that I won’t be using vendor prefixes to keep things concise. Here’s an article on CSS Tricks in case you need help setting up vendor prefixes. The order in which they’re stacked on top of each other doesn’t generally matter, with the exception of the pancake and arm. These need to be placed behind the rest of the images by either defining z-index values, or by utilising the natural stacking order; you’ll see the reason for this later. Personally I opted to use the natural stacking order as it’ll help me cut out a few lines of CSS. It’s also worth noting that I used an animated .gif for the flame. The above just consists of 6 images placed within a container <div>. Let’s add some CSS to make the images appear as they should. I set the container to position: relative; so that I could position the child images in relation to the container, i.e. div#animation. I set the position of each image using position: absolute;. I explicitly set the width and height of the container. This is required as the container would otherwise have no dimensions due to the fact that all it’s child elements are positioned absolutely within it. I added a little padding to the top of the container <div>, to give the head room to bob (no pun intended) up and down. In retrospect, I could have added some margin to the top instead, which would have slightly simplified the calculations of the image positioning. If you use the margin approach, make sure overflow is set to visible (which is default), else you’ll see some cropping. We now have a static version of Bob to which we can add some CSS3 animation. When it comes to creating CSS3 animations, we need to make use of the @keyframes rule. As the name suggests, @keyframes allow us to specify the key frames within the animation. The browser will then “tween” between the frames, i.e. it’ll automatically add the transition. A simple example would be changing the background colour and font colour of a <div> when a user mouses over it. Hover over me to see a CSS3 animation! Initial frame – Dark blue background with white text. Intermediate frame – Light blue background with white text. Final frame – Light blue background with yellow text. All we need to do is specify the above CSS styles within the @keyframes rule, and use percentages to define when those key frames should occur within the duration of the animation. For example 0% would be the start of the animation, and 100% would be the end. You’ll notice that I’ve put example-animation after @keyframes; this is the identifier for the animation and must be specified (obviously, you can name it what you want). It’s also worth noting that you must specify 0% (or the keyword from) and 100% (or to) as a bare minimum, else the keyframes declaration is invalid. You can find out more about @keyframes over at MDN. So at 0%, 50% and 100%, the head is at the default state, and at 25% and 75% the head is translated and rotated (see CSS3 2D Transforms for more information). Translate moves the element along the x-axis (first argument) and y-axis (second argument). A positive value will move the element right/down, whereas a negative value will move the element left/up. Rotate accepts one argument and will rotate in a clockwise fashion, unless a negative value is specified. When specifying multiple transform functions, they should be separated with a space as shown above. You’ll notice that I set the iteration-count to infinite, as I want Bob’s head to be bobbing the whole time the user’s mousing over the canvas. This is a little more tricky as we have to animate 2 image elements separately, while keeping them in sync. The timelines below should help clarify what we’re looking for. Please note that I’ve had to change the axis somewhat, so that the images fit! 0% – Bob’s arm is in it’s default state, i.e. level. The pancake is hidden behind the pan. 10% – At this point, Bob’s arm has been rotated by 15° anti-clockwise. The pancake is still hidden behind the pan. We can achieve this by translating it along the y-axis. 20% – Bob’s arm is back to it’s starting position (and will remain there until the end of this iteration). The pancake on the other hand has been moved up further, as well as rotated 360° anti-clockwise. 50% – The pancake is moved back down behind the pancake, having undergone a 720° anti-clockwise rotation. 100% – No change, to mimic a delay between the flicks. So now we’ve got the head bobbing, the arm flicking and the pancake flying, surely we’re done? Oh dear! Bob’s got himself an extendable arm! The problem we’re seeing above is due to the transform-origin property, which as it’s name suggests, defines the origin of the transform. This property defaults to the centre of the element in question and therefore Bob’s arm is rotating around the centre of the image of the arm. And there we have it! A fully-functional animation of Bob making pancakes! Here’s a download link in case you’d like to download all the assets (HTML, CSS and images) used in the tutorial. I’ve also included the .less file with custom mixins, that I used to create the CSS. If you’d like to learn more about Less, my colleague Andy wrote an awesome Introduction to Less, which should help you get on your way! Thanks for sticking around until the end of the tutorial. Hopefully you’ve learnt a thing or two about CSS3 animations. As always, if you have any questions or constructive criticisms, please don’t hesitate to leave a comment below!